Mrs. C.H. 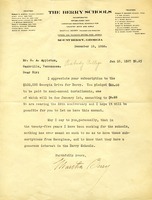 Kelsey sends a $100 donation in response to request for donation from Martha Berry. F.W. Alstaetter donates $10 to the Berry Schools. 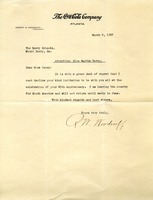 Letter of thanks from Martha Berry to Miss Baily Smith for a letter and gift for The Berry Schools' 25th anniversary. She writes that she hopes that more friends will send gifts for the anniversary. She also writes that investing in these students will "pay one hundred percent in human dividends" and that she wants to help more out. 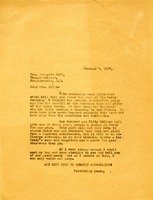 This is a personal letter which was sent to a Mr. Eugene Gunby. Berry thanks Eugene for his sympathy then talks about how she misses her mother and how she is glad that she still has the Berry Schools to work for. Last, this letter is is signed: faithfully your friend. 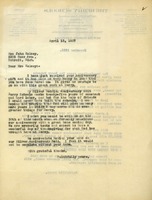 General letter to those who gave anniversary gifts to the Berry Schools for the 25th anniversary. 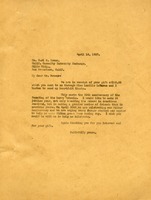 In this letter Martha Berry sends some literature about the Berry Schools. She tells Mrs. Hill that she founded the school twenty five years ago and that there are almost seven hundred students now. She goes on to say that if she were strong enough she would come see her right away but she cannot so a letter will have to do. 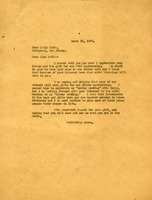 Martha writes to thank Clayton for his letter of sympathy after her mother has passed away. She also informs him about the 25th Anniversary in April and hopes he will attend. Miss Berry thanks Mr. Brown for his donation and informs him that it is the 25th anniversary of the school's founding. She informs him that she hopes to meet a record in donations and invites him to their jubilee celebration. Card expressing appreciation to Martha Berry from an alum. The author mentions a small gift has been included with the card. This appears to be a formal, two-sided card, and there is a graphic included.